Post diameter is 1/4", heads are 3/8". Post lengths range from 1/8" up to 1". For holes 5/16" in diameter. If you're looking for an economical way to bind your project with screw posts, then plastic screw posts are a good choice. By binding with screw posts, it ensures you can easily add and remove pages from your document whenever you wish. Using screw posts you can make or edit swatch books, portfolios, sample books, or any project where loose sheets need to be kept together. Comprised of a screw and a post, they are also called Chicago Screws or Chicago Screw Posts. You will love how easy it is to assemble your project with these white plastic screw posts, since they simply snap together as the barrels are self-tapping and not pre-threaded. These white plastic screw posts are available from 1/8" upto 1" long. Keep in mind that the total length of a post with the screw installed is approximately 1/8" longer than the length that is listed. Also, please note that for the 1/8" size only the heads of the plastic screw posts are smooth and will not allow for use of a screwdriver for removal. The diameter of these posts is 3/16" and they are designed for use with a 1/4" hole that can be either punched or drilled into your documents to accept these posts. The post length for these screw posts are ranging from 1/8" - 1". This means that the maximum binding thickness for these screw posts are 1/8" - 1". For best results and to ensure a correct fit, please measure your document thickness and ensure that it will fit. The heads of the posts and the screws are 7/16" in diameter to ensure a good fit with 1/4" holes. Welcome to MyBinding video. This is everything you need to know about Screw Posts. 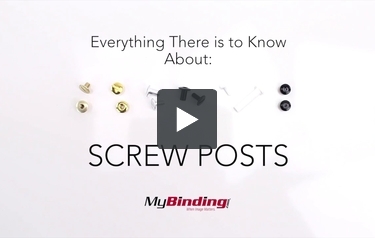 When using screw posts, there is no support to keep your pages straight, so we recommend using a thicker cover to help it from bending easily. They can be good for binding other materials, such as leather, which is thick and can't be used in a punch machine. You can find sizes of posts ranging from 1/8" to 5" and we offer aluminum posts, brass posts, black, gold, white plastic and black plastic. There are also extensions so you can use your smaller posts on the occasional larger project. They are made to fit into holes of 3 and 2-hole punch patterns. And those are screw posts. For more demos, reviews and how-to's, go to MyBinding.com. Do you have a white aluminum screw post? Although we have white plastic screw posts on our site we currently do not offer White Aluminum. However we do have a supplier who can get them for us. Give us a call at 1-800-944-4573 and let us know the size and quantity that you are looking for and we will be glad to give you a quote.